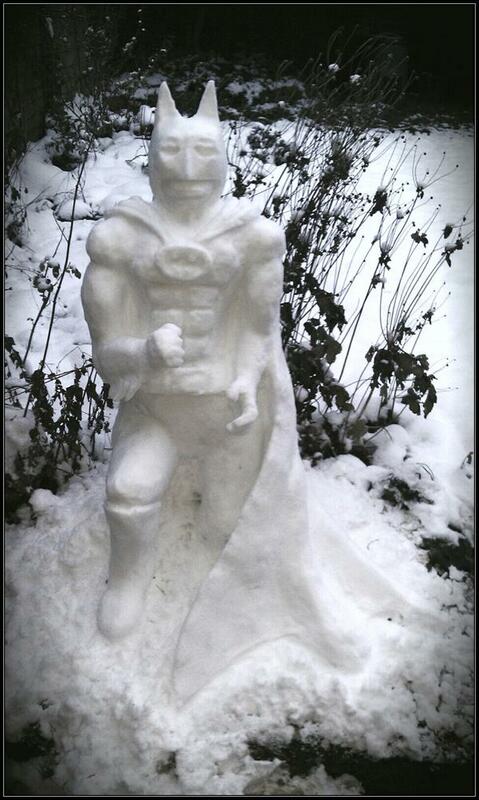 Building a snow sculpture is very much like writing a short story. Don't panic - I've not gone all Swiss Toni (a character from the comedy series Fast Show, who described just about everything as being "very much like making love to a beautiful woman"). I have been taking advantage of the recent snow, though, and it struck me that there are similarities between carving stuff in snow and writing stories. So I thought I'd talk about that. And, I thought, it's a way I can post some pictures of my creations while maintaining a tenuous link to writing. Before you start, you need an appreciation of the limitations of the form. In snow, you need to understand how much weight it can stand, how much you can compress it, what kind of unsupported overhangs you can get away with. With stories, if you're aiming for a particular length (for example if you're intending to enter a competition), you ought to be aware of the restrictions in terms of number of characters, settings, and timespan a shorter word count brings. The rough draft is where you make all your mistakes. You're free to get too ambitious, overload the structure, and leave bits that seem like they might be tricky for later on. All you need is for something that feels about right, is roughly the correct shape and size. You want something that will serve as a sound foundation for the masterpiece with which you'll eventually replace it. Don't sweat the details at this point; don't lose heart if it doesn't quite work or seems shoddy and unpolished. And if it looks like a non-starter after all, you won't have lost too much time at this point. Scrap it and try coming at it from a new angle, or switch to something entirely different. Don't be afraid to try something new. Bend the rules. Stretch yourself. You've got nothing to lose. Ask questions about what you're doing. Why should a short story have a beginning, middle, and end in that order? Who says you can't tell a story through Facebook updates, or classified ads, or via a menu? Why should a story be third-person, past tense? Why should a snowman look like the one from the John Lewis advert? Once you've got the basic structure in place, the real work begins. Refine what you've done, add bits, take bits away, hone it and hone it until it's as close to the idea you have in your head as you can possibly get it. This is where you need to trust your instincts, and be realistic about what you can achieve. In some ways, this is the best bit, because this is where your work really starts to come to life. But it can be nerve-wracking too - as you get closer to the finishing line, it can be difficult to force yourself to make changes, even when you know deep down they're the right thing to do. Hold your nerve, and keep going. Once you've finished, take a step back and take a good look at what you've created. Unless you've been extremely fortunate, at least one part of it won't have gone entirely to plan. You'll have had to compromise on something, or you'll have realised just as you finished it off that it would have been better to structure the whole thing slightly differently. On the other hand, there'll almost certainly be parts that went better than you expected, bits that when you read back fill you with pride. These responses are valuable - you can learn plenty from both of them, and apply your new-found knowledge to your next project. Onwards and upwards! 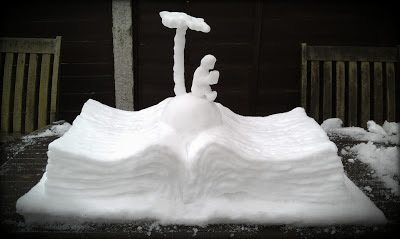 So, that's what I've been up to, and if these tips spur you on to build a snow-thing, write a story, or do something else equally creative, please let me know. Excellent photos - and good luck with the comp judging! These are just brilliant, Dan. 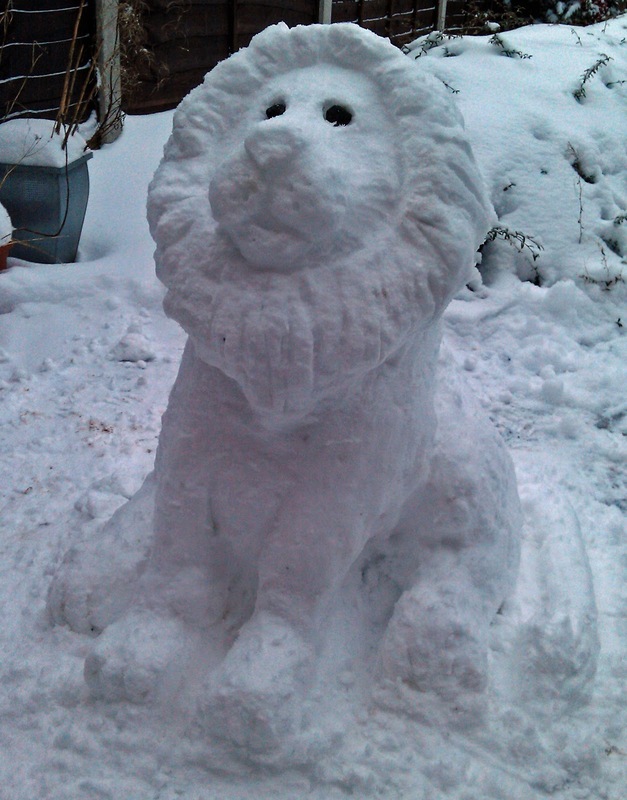 All fab advice, Dan - and much impressed with the snow sculptures! I often make the analogy between writing and drawing when trying to explain things. People are still none the wiser. Thanks, everybody - I expect what I've said here rings true for a lot of creative endeavours. You do a rough first-pass attempt, come back for more refining and restructuring and finally add the finesse. 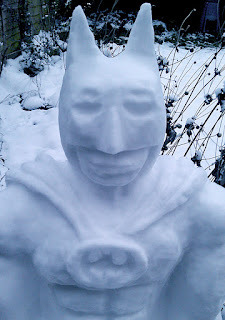 It just struck me that working with snow was more similar to working with words than other sculpting, as with snow if you take away too much you can usually replace it with more snow, so there are parallels with editing. Excellent snow sculptures Dan - I especially like the batman one. Good job you don't live somewhere really snowy otherwise you might never get any short stories finished. Congratulations on the competition win too - I meant to comment on your previous post but time got away from me. Well done! Lovely sculptures. yours is my second dose of snow today - my son in Canada posted pictures of Niagara on the Lake. 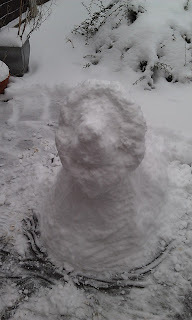 And last week my elder son and his children built an igloo! Thanks, Ric - Batman was probably my favourite though of course he's long gone now. Thanks for the congratulations, too!